DEMO DAISY, Birmingham, 01/31/2012, Evening, race 11, post #6. MC FULL MOON, Bluffs Run, 01/31/2012, Afternoon, race 15, post #3. RAMS KIZZY KATE, Tucson, 01/31/2012, Evening, race 12, post #4. WW GALE THIRTY, Wheeling, 01/31/2012, Afternoon, race 5, post #2. BELLA KAYAKER, Wheeling, 01/31/2012, Afternoon, race 9, post #4. POTRS STRIKEOUT, Birmingham, 01/30/2012, Afternoon, race 2 post #2. Result: 8-6-2- . LAVA MATSUI, Birmingham, 01/30/2012, Afternoon, race 8 post #8. Result: 5-1-2- . WW'S GUCCI, Orange Park, 01/30/2012, Evening, race 11 post #1. Result: 2-6-1- . KCK CANDIBAR, Palm Beach, 01/30/2012, Afternoon, race 4 post #2. Result: 1-4-6- . JUST TERRIFIC, Palm Beach, 01/30/2012, Afternoon, race 12 post #7. Result: 6-3-1- . WW MISTY MONTY, Sanford Orlando, 01/30/2012, Afternoon, race 11 post #6. Result: 2-5-1- . GABLE EDDIE, Derby Lane, 01/30/2012, Evening, race 6 post #7. Result: 3-4-2- . REDROCK MIRROR, Tucson, 01/30/2012, Evening, race 8 post #4. Result: 2-4-1- . OUT D BOX, Tucson, 01/30/2012, Evening, race 12 post #5. Result: 6-7-4- . RED PERSISTENCE, Tucson, 01/30/2012, Evening, race 12 post #7. Result: 6-7-4- . POTRS STRIKEOUT, Birmingham, 01/30/2012, Afternoon, race 2, post #2. LAVA MATSUI, Birmingham, 01/30/2012, Afternoon, race 8, post #8. WW'S GUCCI, Orange Park, 01/30/2012, Evening, race 11, post #1. KCK CANDIBAR, Palm Beach, 01/30/2012, Afternoon, race 4, post #2. JUST TERRIFIC, Palm Beach, 01/30/2012, Afternoon, race 12, post #7. WW MISTY MONTY, Sanford Orlando, 01/30/2012, Afternoon, race 11, post #6. GABLE EDDIE, Derby Lane, 01/30/2012, Evening, race 6, post #7. REDROCK MIRROR, Tucson, 01/30/2012, Evening, race 8, post #4. OUT D BOX, Tucson, 01/30/2012, Evening, race 12, post #5. RED PERSISTENCE, Tucson, 01/30/2012, Evening, race 12, post #7. JET FORCE, Bluffs Run, 01/29/2012, Afternoon, race 11 post #5. Result: 1-6-8- . CRY HOMER, Gulf Greyhound, 01/29/2012, Afternoon, race 12 post #5. Result: 3-1-2- . KIOWA DELI DEE, Orange Park, 01/29/2012, Afternoon, race 11 post #2. Result: 2-4-6- . MAGIC TORPEDO, Tri-State, 01/29/2012, Evening, race 13 post #4. Result: 5-7-3- . POTRS STRIKEOUT, Birmingham, 01/27/2012, Evening, race 3 post #5. Result: 6-3-8- . WP'S CLINTON, Orange Park, 01/27/2012, Evening, race 10 post #1. Result: 3-1-5- . WW'S GUCCI, Orange Park, 01/27/2012, Evening, race 11 post #8. Result: 5-3-6- . JS KERRY OKI, Palm Beach, 01/27/2012, Afternoon, race 2 post #8. Result: 8-3-2- . RK'S CONK GONK, Palm Beach, 01/27/2012, Afternoon, race 15 post #4. Result: 8-3-7- . WHATS NEXT, Palm Beach, 01/27/2012, Afternoon, race 15 post #6. Result: 8-3-7- . STARZ EQUALMIST, Palm Beach, 01/27/2012, Evening, race 12 post #2. Result: 2-1-3- . DEMO DAISY, Birmingham, 01/28/2012, Afternoon, race 2, post #1. LAVA MATSUI, Birmingham, 01/28/2012, Afternoon, race 4, post #2. COACH PRINCESS, Birmingham, 01/28/2012, Afternoon, race 9, post #2. DODGE CALIBER, Birmingham, 01/28/2012, Evening, race 9, post #2. FM SAPPHIRE, Birmingham, 01/28/2012, Evening, race 11, post #7. POTRS STRIKEOUT, Birmingham, 01/27/2012, Evening, race 3, post #5. WP'S CLINTON, Orange Park, 01/27/2012, Evening, race 10, post #1. WW'S GUCCI, Orange Park, 01/27/2012, Evening, race 11, post #8. JS KERRY OKI, Palm Beach, 01/27/2012, Afternoon, race 2, post #8. RK'S CONK GONK, Palm Beach, 01/27/2012, Afternoon, race 15, post #4. WHATS NEXT, Palm Beach, 01/27/2012, Afternoon, race 15, post #6. STARZ EQUALMIST, Palm Beach, 01/27/2012, Evening, race 12, post #2. SNEAKY PEEKY, Sarasota, 01/27/2012, Evening, race 8, post #7. TROUGELZ, Southland, 01/27/2012, Evening, race 7, post #2. WW MISTY MONTY, Sanford Orlando, 01/27/2012, Afternoon, race 13, post #2. CRY HOMER, Gulf Greyhound, 01/26/2012, Evening, race 7 post #3. Result: 6-5-2- . KB'S HASLET, Mardi Gras, 01/26/2012, Evening, race 4 post #7. Result: 2-3-8- . JUST TERRIFIC, Palm Beach, 01/26/2012, Afternoon, race 5 post #7. Result: 7-8-6- . AMF SULTANA, Palm Beach, 01/26/2012, Afternoon, race 15 post #2. Result: 2-4-1- . MADISON SQUARE, Southland, 01/26/2012, Evening, race 11 post #5. Result: 4-2-7-8. RAMS KIZZY KATE, Tucson, 01/26/2012, Evening, race 9 post #6. Result: 7-2-6- . OUT D BOX, Tucson, 01/26/2012, Evening, race 12 post #5. Result: 8-2-4- . CRY HOMER, Gulf Greyhound, 01/26/2012, Evening, race 7, post #3. KB'S HASLET, Mardi Gras, 01/26/2012, Evening, race 4, post #7. JUST TERRIFIC, Palm Beach, 01/26/2012, Afternoon, race 5, post #7. AMF SULTANA, Palm Beach, 01/26/2012, Afternoon, race 15, post #2. MADISON SQUARE, Southland, 01/26/2012, Evening, race 11, post #5. RAMS KIZZY KATE, Tucson, 01/26/2012, Evening, race 9, post #6. OUT D BOX, Tucson, 01/26/2012, Evening, race 12, post #5. COACH PRINCESS, Birmingham, 01/25/2012, Afternoon, race 5 post #5. Result: 1-7-2- . LAVA MATSUI, Birmingham, 01/25/2012, Afternoon, race 5 post #4. Result: 1-7-2- . ROOFTOP SAWEDOFF, Birmingham, 01/25/2012, Afternoon, race 10 post #5. Result: 1-7-6- . FM SAPPHIRE, Birmingham, 01/25/2012, Evening, race 10 post #7. Result: 1-3-5- . DODGE CALIBER, Birmingham, 01/25/2012, Evening, race 11 post #1. Result: 7-1-2- . DLT EXTRACTOR, Gulf Greyhound, 01/25/2012, Afternoon, race 8 post #7. Result: 2-1-3- . KIOWA VANESSA, Orange Park, 01/25/2012, Evening, race 7 post #8. Result: 4-7-8- . MAGIC TEMPURA, Orange Park, 01/25/2012, Evening, race 14 post #5. Result: 6-1-5- . KCK CANDIBAR, Palm Beach, 01/25/2012, Afternoon, race 4 post #3. Result: 4-3-7- . TEN FOR TEE, Sarasota, 01/25/2012, Afternoon, race 14 post #3. Result: 8-4-3- . BD'S RED DAWN, Derby Lane, 01/25/2012, Evening, race 11 post #5. Result: 7-1-8- . GAME PLANE, Tucson, 01/25/2012, Evening, race 8 post #7. Result: 1-5-7- . MULBERRY CORA, Tucson, 01/25/2012, Evening, race 11 post #2. Result: 7-4-2- . BELLA KAYAKER, Wheeling, 01/25/2012, Afternoon, race 14 post #6. Result: 2-5-3- . COACH PRINCESS, Birmingham, 01/25/2012, Afternoon, race 5, post #5. LAVA MATSUI, Birmingham, 01/25/2012, Afternoon, race 5, post #4. ROOFTOP SAWEDOFF, Birmingham, 01/25/2012, Afternoon, race 10, post #5. FM SAPPHIRE, Birmingham, 01/25/2012, Evening, race 10, post #7. DODGE CALIBER, Birmingham, 01/25/2012, Evening, race 11, post #1. DLT EXTRACTOR, Gulf Greyhound, 01/25/2012, Afternoon, race 8, post #7. KIOWA VANESSA, Orange Park, 01/25/2012, Evening, race 7, post #8. MAGIC TEMPURA, Orange Park, 01/25/2012, Evening, race 14, post #5. KCK CANDIBAR, Palm Beach, 01/25/2012, Afternoon, race 4, post #3. TEN FOR TEE, Sarasota, 01/25/2012, Afternoon, race 14, post #3. BD'S RED DAWN, Derby Lane, 01/25/2012, Evening, race 11, post #5. GAME PLANE, Tucson, 01/25/2012, Evening, race 8, post #7. MULBERRY CORA, Tucson, 01/25/2012, Evening, race 11, post #2. BELLA KAYAKER, Wheeling, 01/25/2012, Afternoon, race 14, post #6. DEMO DAISY, Birmingham, 01/24/2012, Evening, race 3 post #2. Result: 6-8-2- . CRS SPIDER WEB, Melbourne, 01/24/2012, Afternoon, race 7 post #6. UHAUL MUFFIN, Palm Beach, 01/24/2012, Afternoon, race 12 post #7. Result: 3-8-1- . COUSIN KIM, Sarasota, 01/24/2012, Afternoon, race 3 post #7. Result: 1-4-2- . GABLE EDDIE, Derby Lane, 01/24/2012, Evening, race 10 post #7. Result: 7-1-3- . REDROCK MIRROR, Tucson, 01/24/2012, Evening, race 6 post #5. Result: 3-1- - . RED PERSISTENCE, Tucson, 01/24/2012, Evening, race 14 post #5. Result: 6-1-3- . BELLA CUBANARO, Wheeling, 01/24/2012, Afternoon, race 9 post #6. Result: 2-1-8- . WW GALE THIRTY, Wheeling, 01/24/2012, Afternoon, race 14 post #8. Result: 8-3-5- . ROOFTOP SAWEDOFF, Birmingham, 01/23/2012, Afternoon, race 8 post #2. Result: 5-7-2- . COACH PRINCESS, Birmingham, 01/23/2012, Afternoon, race 12 post #2. Result: 8-2-3- . POTRS STRIKEOUT, Birmingham, 01/23/2012, Afternoon, race 13 post #5. Result: 3-4-2- . LAVA MATSUI, Birmingham, 01/23/2012, Afternoon, race 14 post #1. Result: 2-1-5- . WW'S GUCCI, Orange Park, 01/23/2012, Evening, race 5 post #7. Result: 7-8-3- . KIOWA DELI DEE, Orange Park, 01/23/2012, Evening, race 9 post #2. Result: 6-3-4- . GMC DIANE SAWYER, Palm Beach, 01/23/2012, Afternoon, race 6 post #8. Result: 7-3-2- . MONKEYS UNCLE, Palm Beach, 01/23/2012, Afternoon, race 6 post #6. Result: 7-3-2- . BACS XTREME, Palm Beach, 01/23/2012, Afternoon, race 14 post #1. Result: 3-1-4- . MESA BACKSTOP, Derby Lane, 01/23/2012, Evening, race 4 post #4. Result: 4-6-1- . MAGIC TORPEDO, Tri-State, 01/23/2012, Evening, race 8 post #5. Result: 1-7-6- . OUT D BOX, Tucson, 01/23/2012, Evening, race 9 post #1. Result: 4-1-2- . RAMS CASH CARSON, Tucson, 01/23/2012, Evening, race 9 post #5. Result: 4-1-2- . DEMO DAISY, Birmingham, 01/24/2012, Evening, race 3, post #2. CRS SPIDER WEB, Melbourne, 01/24/2012, Afternoon, race 7, post #6. UHAUL MUFFIN, Palm Beach, 01/24/2012, Afternoon, race 12, post #7. COUSIN KIM, Sarasota, 01/24/2012, Afternoon, race 3, post #7. GABLE EDDIE, Derby Lane, 01/24/2012, Evening, race 10, post #7. REDROCK MIRROR, Tucson, 01/24/2012, Evening, race 6, post #5. RED PERSISTENCE, Tucson, 01/24/2012, Evening, race 14, post #5. BELLA CUBANARO, Wheeling, 01/24/2012, Afternoon, race 9, post #6. WW GALE THIRTY, Wheeling, 01/24/2012, Afternoon, race 14, post #8. 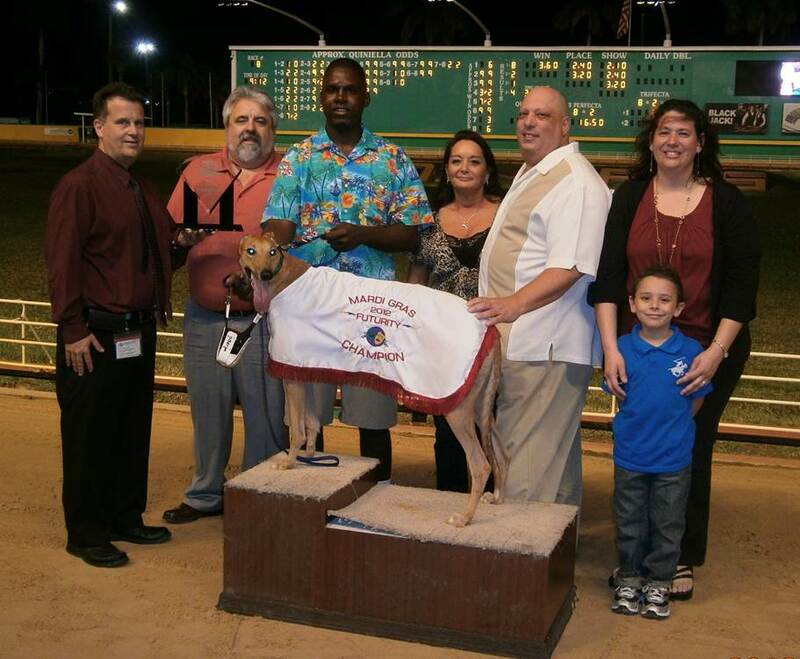 RK’S CONK GONK ZONKS FIELD IN PALM BEACH KENNEL CLUB $50,000 HE’S MY MAN CLASSIC FINALE! West Palm Beach, Fl. - Rader Racing Kennel’s RK’s Conk Gonk added another notch to his championship belt as he defeated a top-notch field of seven other world-class Greyhounds with his victory in Saturday afternoon’s 32nd running of Palm Beach Kennel Club’s $50,000 He’s My Man Classic. Wearing the lucky green of post position four, Conk Gonk broke evenly with the rest of the finalists and then turned on the afterburners in his rush to the first turn. He led throughout the duration of the final, winning by more than four lengths in a 545-yard Royal Palm Course clocking of 29.70 seconds and returning an even $6.00 to his many, many fans. Hilco Burner put on a nice finishing kick to finish second, with Riverview Stevie and Jack’s Go Bayou finishing in a dead-heat for third. GABLE WARBUCKS, Bluffs Run, 01/22/2012, Afternoon, race 5 post #6. Result: 6-2-8- . GABLE GO SHAUNEE, Bluffs Run, 01/22/2012, Afternoon, race 10 post #6. Result: 3-2-5- . ORANGE PASS, Orange Park, 01/22/2012, Afternoon, race 8 post #4. Result: 8-4-5- . FLYING LAHINCH, Wheeling, 01/22/2012, Afternoon, race 7 post #3. Result: 2-1-6- . ROOFTOP SAWEDOFF, Birmingham, 01/23/2012, Afternoon, race 8, post #2. COACH PRINCESS, Birmingham, 01/23/2012, Afternoon, race 12, post #2. POTRS STRIKEOUT, Birmingham, 01/23/2012, Afternoon, race 13, post #5. LAVA MATSUI, Birmingham, 01/23/2012, Afternoon, race 14, post #1. DEMO DAISY, Birmingham, 01/21/2012, Afternoon, race 4 post #3. Result: 5-3-7- . COACH PRINCESS, Birmingham, 01/21/2012, Afternoon, race 6 post #3. Result: 5-8-1- . DODGE CALIBER, Birmingham, 01/21/2012, Evening, race 9 post #6. Result: 8-4-2- . FM SAPPHIRE, Birmingham, 01/21/2012, Evening, race 15 post #8. Result: 4-7-8- . ROUGH HUSTLE, Gulf Greyhound, 01/21/2012, Evening, race 10 post #7. Result: 6-1-8- . KB'S HASLET, Mardi Gras, 01/21/2012, Afternoon, race 4 post #2. Result: 3-7-8- . GABLE WARBUCKS, Bluffs Run, 01/22/2012, Afternoon, race 5, post #6. GABLE GO SHAUNEE, Bluffs Run, 01/22/2012, Afternoon, race 10, post #6. ORANGE PASS, Orange Park, 01/22/2012, Afternoon, race 8, post #4. FLYING LAHINCH, Wheeling, 01/22/2012, Afternoon, race 7, post #3. LAVA MATSUI, Birmingham, 01/20/2012, Evening, race 8 post #3. Result: 3-7-2- . POTRS STRIKEOUT, Birmingham, 01/20/2012, Evening, race 15 post #6. Result: 2-8-1- . JET FORCE, Bluffs Run, 01/20/2012, Afternoon, race 7 post #5. Result: 3-5-6- . SLATEX EMERALD, Bluffs Run, 01/20/2012, Afternoon, race 7 post #3. Result: 3-5-6- . DEMO DAISY, Birmingham, 01/21/2012, Afternoon, race 4, post #3. COACH PRINCESS, Birmingham, 01/21/2012, Afternoon, race 6, post #3. DODGE CALIBER, Birmingham, 01/21/2012, Evening, race 9, post #6. FM SAPPHIRE, Birmingham, 01/21/2012, Evening, race 15, post #8. After several qualifying rounds, Riverview Stevie, a greyhound that ran in Dubuque last season, is the top point-getter for the He's My Man Classic at Palm Beach. Stevie's 50 points edged a perennial strong RK's Conk Gonk's 47, as they are the top finalists for Saturday afternoon's race. Riverview Stevie won the King & Queen stakes at Dubuque last year, posting a four-length win. She's been on a roll ever since going to Palm Beach, with eight firsts, three seconds and a third in her 12 starts. At Dubuque, she had 32 starts, with five firsts, 10 seconds and seven thirds. The finals will be the 12th race. Riverview Stevie is in the one box and RK's Conk Gonk is in the four box. He's My Man is the first of the "Big 3" events at Palm Beach. GALE WW WYNONO, Bluffs Run, 01/19/2012, Afternoon, race 11 post #5. Result: 8-1-5- . KCK CANDIBAR, Palm Beach, 01/19/2012, Afternoon, race 4 post #4. Result: 5-3-1- . BACS XTREME, Palm Beach, 01/19/2012, Afternoon, race 13 post #4. Result: 3-8-4- . COUSIN KIM, Sarasota, 01/19/2012, Afternoon, race 9 post #5. Result: 8-1-7- . SNEAKY PEEKY, Sarasota, 01/19/2012, Afternoon, race 10 post #3. Result: 1-4-6- . BD'S RED DAWN, Derby Lane, 01/19/2012, Evening, race 6 post #4. Result: 5-2-3- . GABLE EDDIE, Derby Lane, 01/19/2012, Evening, race 10 post #7. Result: 7-2-4- . D BOX, Tucson, 01/19/2012, Evening, race 3 post #8. Result: 7-2-6- . RED PERSISTENCE, Tucson, 01/19/2012, Evening, race 9 post #4. Result: 3-6-4- . LAVA MATSUI, Birmingham, 01/20/2012, Evening, race 8, post #3. POTRS STRIKEOUT, Birmingham, 01/20/2012, Evening, race 15, post #6. JET FORCE, Bluffs Run, 01/20/2012, Afternoon, race 7, post #5. SLATEX EMERALD, Bluffs Run, 01/20/2012, Afternoon, race 7, post #3. DLT EXTRACTOR, Gulf Greyhound, 01/20/2012, Evening, race 4, post #5. KIOWA DELI DEE, Orange Park, 01/20/2012, Evening, race 14, post #3. WW'S GUCCI, Orange Park, 01/20/2012, Evening, race 15, post #1. GMC DIANE SAWYER, Palm Beach, 01/20/2012, Afternoon, race 6, post #8. MONKEYS UNCLE, Palm Beach, 01/20/2012, Afternoon, race 6, post #6. TEN FOR TEE, Sarasota, 01/20/2012, Afternoon, race 7, post #5. MADISON SQUARE, Southland, 01/20/2012, Evening, race 18, post #1. EDROCK MIRROR, Tucson, 01/20/2012, Evening, race 12, post #3. UCME CHICKABOOM, Wheeling, 01/20/2012, Afternoon, race 9, post #6. AMF EX PRESIDENT, Wheeling, 01/20/2012, Afternoon, race 11, post #6. FLYING HABANERO, Wheeling, 01/20/2012, Afternoon, race 16, post #8. FLYING KILLERBEE, Wheeling, 01/20/2012, Evening, race 12, post #1. Greyhounds in a Super Bowl ad? Because the Super Bowl is perhaps the most widely watched TV show of the year, and its ads attract incredible attention, it could mean a lot of exposure for the world's greatest canine athlete--who, in addition to their grace and athleticism, happen to also make ideal pets after their retirement from racing. But, to few people's surprise, Grey2K is objecting to the Skechers shoe company's ad that's scheduled for presentation during the upcoming Super Bowl. Skechers has assured those objecting that no animals were placed in any danger or risk during the filming of the commercial, thus it's sticking to its guns and says it's going ahead with running the ad. NGA members are welcome to link to the attached petition to express their viewpoint on the Skechers issue. Wayne Ward Kennel’s WW’s Kay Quarter has won four out of his last five Grade AA starts for trainer Ron Otto. 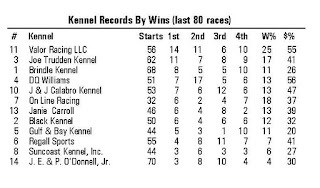 Kennel-mate WWK Win Day has three straight Grade AA wins. Douglas Kennel’s Got A Plan has three victories and a second in his last four Grade AA trips for trainer Joe Douglas. 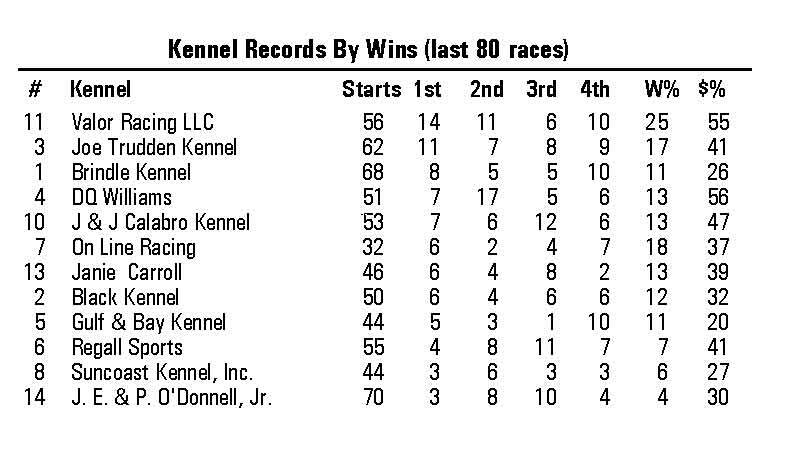 Kennel-mate SL Amarillo has won three out of his last four Grade AA races. Ryan Farms Kennel’s Scimitar has back-to-back Grade AA marathon wins for trainer Mick D’Arcy. Darren Henry Kennel’s Thera Of Ruckus has two straight Grade AA 3/8 victories for trainer Terry Green. Lester Raines Kennel’s Windy Bev has four wins (M, D, C, B) and a second in her first six career starts for trainer Joel Roden. Campbell Racing Kennel’s Morebars has back-to-back victories (B, A) for trainer Joe Otto. COACH PRINCESS, Birmingham, 01/18/2012, Afternoon, race 6 post #2. Result: 5-2-6- . DEMO DAISY, Birmingham, 01/18/2012, Afternoon, race 12 post #6. Result: 1-2-7- . FM SAPPHIRE, Birmingham, 01/18/2012, Evening, race 4 post #5. Result: - - - . DODGE CALIBER, Birmingham, 01/18/2012, Evening, race 7 post #3. Result: - - - . GALE WW WYNONO, Bluffs Run, 01/19/2012, Afternoon, race 11, post #5. KCK CANDIBAR, Palm Beach, 01/19/2012, Afternoon, race 4, post #4. BACS XTREME, Palm Beach, 01/19/2012, Afternoon, race 13, post #4. LAVA MATSUI, Birmingham, 01/17/2012, Evening, race 7 post #1. Result: 5-1-4- . SLATEX TOPAZ, Bluffs Run, 01/17/2012, Afternoon, race 3 post #6. Result: 6-8-1- . GABLE WARBUCKS, Bluffs Run, 01/17/2012, Afternoon, race 6 post #2. Result: 2-5-3- . GAME PLANE, Tucson, 01/17/2012, Evening, race 6 post #5. Result: 1-2-8- . RAMS KIZZY KATE, Tucson, 01/17/2012, Evening, race 14 post #5. Result: 5-8-7- . REDROCK MIRROR, Tucson, 01/17/2012, Evening, race 14 post #7. Result: 5-8-7- . COACH PRINCESS, Birmingham, 01/18/2012, Afternoon, race 6, post #2. DEMO DAISY, Birmingham, 01/18/2012, Afternoon, race 12, post #6. FM SAPPHIRE, Birmingham, 01/18/2012, Evening, race 4, post #5. DODGE CALIBER, Birmingham, 01/18/2012, Evening, race 7, post #3. If the rest of 2012 remains as competitive as the first two weeks of this year, then everyone is in for quite a show. 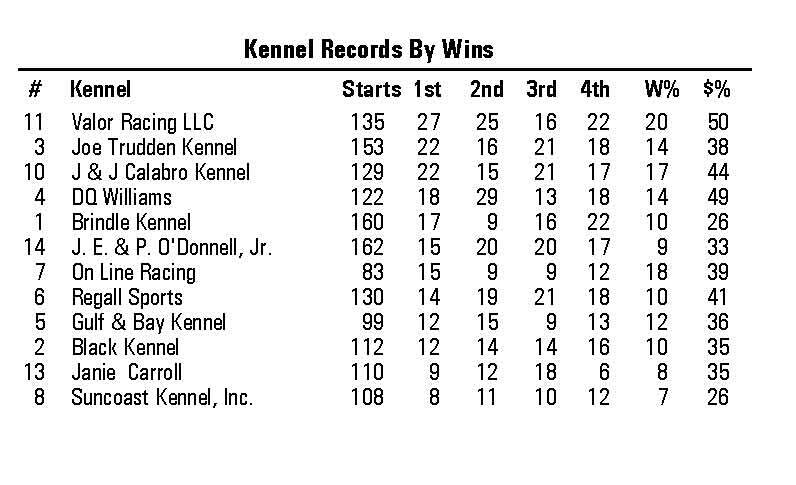 Entering this week, there was a tie at the top of the kennel standings between K-Rod Kennel, trained by Cindy Unrein, and D.Q. Williams Kennel, trained by Craig Edwards. Once again, these two kennels battled down to the very end of the week for the weekly honors of Kennel of the Week. In the end, K-Rod Kennel earned the award by a margin of less than $60. With 58 starts this week, K-Rod Kennel had 15 wins, 5 seconds, 10 thirds and 5 fourth place finishes accumulating $8,525.40 in purse money. For this week’s Greyhound of the Week, we turn to an `oldie but a goodie`. With a career record of 113/48-23-15-8, Rough Hustle from D.Q. Williams Kennel has punched his ticket into Gulf Greyhound Park’s Hall of Fame and earned this week’s honors with his come from behind victory on Thursday evening January 12. During a stretch of time from July to September of 2011, Rough Hustle was the hottest greyhound on the Texas Gulf Coast winning 7 out of 9 grade AA races. The well went dry after his top grade victory on September 16 going winless over the next four months including a six-week break away from the racing action. Approaching the age of four, questions started to pop into the minds of some whether the outstanding career of the 71-pound superstar bred from Dodgem by Design – Chantel Rose had seen its better days. The answer to that question is `not yet` after claiming his recent top grade win. The stage was set in the tenth race January 12 with Rough Hustle drawing a favorable #2 post for his rail running style. 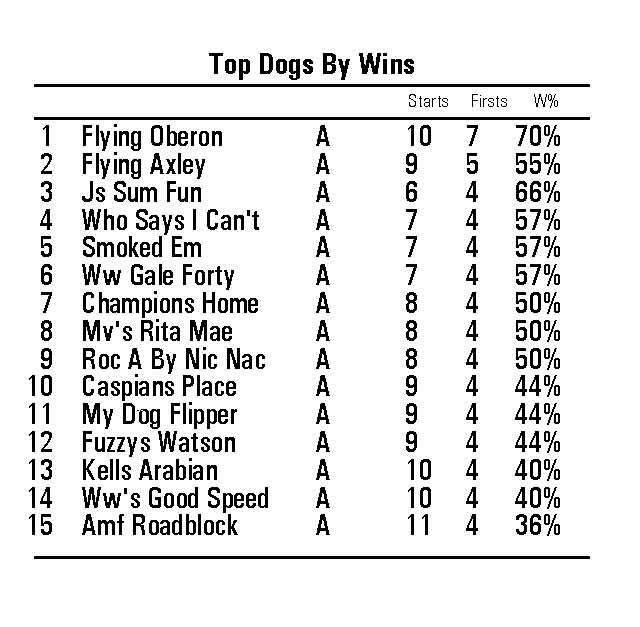 The deck was stacked with a difficult field including recent winners KB’s Layla of K-Rod Kennel, kennelmate Cecil Deville and recent Greyhound of the Week, Nina’s Fire Pen of Libby Racing Kennels. Despite the winless drought, Rough Hustle still deserves the respect of the betting public sent off at reasonable odds of 4 to 1. 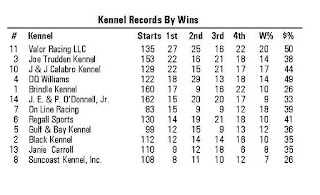 As expected, KB’s Layla launched herself to the early lead, followed closely by DLT Traitorsplan of Lingle Kennel and Rough Hustle settled into a perfect stalking position in third place. With the leaders in his sights, Rough Hustle closed the gap with every stride and eventually circled around KB’s Layla at the top of the stretch to pull away by 1-½ lengths in a winning time of 30.44 seconds. Congratulations to owner Sharon Williams, trainer Craig Edwards and to one of best greyhounds to ever set their paws on the La Marque, Texas racing oval, Rough Hustle for this week’s honors. FINALISTS SET TO GO IN PALM BEACH KENNEL CLUB $50,000 HE'S MY MAN CLASSIC SATURDAY AFTERNOON, JAN. 21! Racing Lines and Classic Fun Attached! West Palm Beach, Fl. 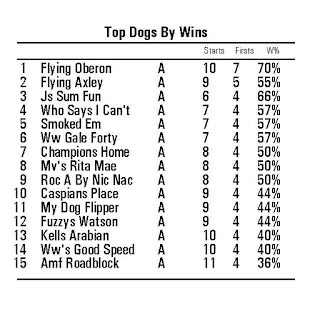 - With a second-place finish in last Sunday’s semifinals and a sixth-place showing by her previously undefeated kennel mate RK’s Conk Gonk, Rader Racing Kennel’s Riverview Stevie earned top point-earner status as the countdown to the finale of Palm Beach Kennel Club’s $50,000 He’s My Man Classic draws near. Riverview Stevie gave a valiant effort in attempting to chase down another kennel mate, Whats Next, but the fleet-pawed early speedster built up to much of an early lead. In the final semifinal qualifier Sunday afternoon, the aforementioned RK’s Conk Gonk succumbed to an abundance of early speed around him at the break, allowing youngster and 15-1 long shot Kane’s Getty to snag the first-turn advantage, the victory and a shot at the $25,000 first-place treasure. The $50,000 He’s My Man Classic finalists will meet in Saturday afternoon’s twelfth race, all going for the $25,000 first-place prize. A press conference and post position draw will be held in the track’s Terrace Restaurant Thursday afternoon, January 19, commencing at 11:45 a.m. 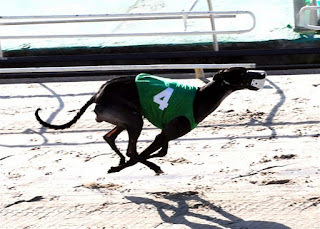 The $50,000 He’s My Man Classic is the first event in Palm Beach Kennel Club’s $150,000 “Big 3" Stakes series, which includes the $50,000 James W. Paul 3/8ths Mile Derby (Saturday afternoon, February 25) and the $50,000 Arthur J. Rooney, Sr. St. Patrick’s Invitational (Saturday afternoon, March 17). LAVA MATSUI, Birmingham, 01/17/2012, Evening, race 7, post #1. SLATEX TOPAZ, Bluffs Run, 01/17/2012, Afternoon, race 3, post #6. GABLE WARBUCKS, Bluffs Run, 01/17/2012, Afternoon, race 6, post #2. GAME PLANE, Tucson, 01/17/2012, Evening, race 6, post #5. RAMS KIZZY KATE, Tucson, 01/17/2012, Evening, race 14, post #5. REDROCK MIRROR, Tucson, 01/17/2012, Evening, race 14, post #7. GALE WW WYNONO, Bluffs Run, 01/13/2012, Afternoon, race 7 post #8. Result: 7-5-8- . SLATEX EMERALD, Bluffs Run, 01/13/2012, Afternoon, race 7 post #7. Result: 7-5-8- . PADDY WHACKER, Mardi Gras, 01/13/2012, Afternoon, race 8 post #3. Result: 1-7-6- . MAGIC TEMPURA, Orange Park, 01/13/2012, Evening, race 5 post #2. Result: 6-8-2- . WP'S CLINTON, Orange Park, 01/13/2012, Evening, race 7 post #3. Result: 7-2-1- . WW'S GUCCI, Orange Park, 01/13/2012, Evening, race 15 post #1. Result: 6-1-8- . AMF SULTANA, Palm Beach, 01/13/2012, Afternoon, race 12 post #4. Result: 5-6-7- . JUST TERRIFIC, Palm Beach, 01/13/2012, Afternoon, race 15 post #8. Result: 6-1-7- . TEN FOR TEE, Sarasota, 01/13/2012, Afternoon, race 14 post #2. Result: 2-3-4- . SNEAKY PEEKY, Sarasota, 01/13/2012, Evening, race 12 post #3. Result: 7-1-3- . BELLA DA BULL, Southland, 01/13/2012, Evening, race 7 post #4. Result: 1-2-8- . RAMS CASH CARSON, Tucson, 01/13/2012, Evening, race 1 post #8. Result: 8-7-3- . REDROCK MIRROR, Tucson, 01/13/2012, Evening, race 12 post #3. Result: 7-8-2- . FLYING KILLERBEE, Wheeling, 01/13/2012, Afternoon, race 3 post #2. Result: 2-1-3- . FLYING HABANERO, Wheeling, 01/13/2012, Afternoon, race 17 post #2. Result: 1-3-2- . AMF EX PRESIDENT, Wheeling, 01/13/2012, Evening, race 9 post #1. Result: 1-2-3- . GALE WW WYNONO, Bluffs Run, 01/13/2012, Afternoon, race 7, post #8. SLATEX EMERALD, Bluffs Run, 01/13/2012, Afternoon, race 7, post #7. PADDY WHACKER, Mardi Gras, 01/13/2012, Afternoon, race 8, post #3. MAGIC TEMPURA, Orange Park, 01/13/2012, Evening, race 5, post #2. WP'S CLINTON, Orange Park, 01/13/2012, Evening, race 7, post #3. WW'S GUCCI, Orange Park, 01/13/2012, Evening, race 15, post #1. AMF SULTANA, Palm Beach, 01/13/2012, Afternoon, race 12, post #4. JUST TERRIFIC, Palm Beach, 01/13/2012, Afternoon, race 15, post #8. TEN FOR TEE, Sarasota, 01/13/2012, Afternoon, race 14, post #2. SNEAKY PEEKY, Sarasota, 01/13/2012, Evening, race 12, post #3. BELLA DA BULL, Southland, 01/13/2012, Evening, race 7, post #4. RAMS CASH CARSON, Tucson, 01/13/2012, Evening, race 1, post #8. REDROCK MIRROR, Tucson, 01/13/2012, Evening, race 12, post #3. FLYING KILLERBEE, Wheeling, 01/13/2012, Afternoon, race 3, post #2. FLYING HABANERO, Wheeling, 01/13/2012, Afternoon, race 17, post #2. AMF EX PRESIDENT, Wheeling, 01/13/2012, Evening, race 9, post #1. GABLE GO SHAUNEE, Bluffs Run, 01/12/2012, Afternoon, race 2 post #5. Result: 6-5-8- . MC FULL MOON, Bluffs Run, 01/12/2012, Afternoon, race 15 post #7. Result: 3-7-4- . ROUGH HUSTLE, Gulf Greyhound, 01/12/2012, Evening, race 10 post #2. Result: 2-3-5- . KB'S HASLET, Mardi Gras, 01/12/2012, Afternoon, race 2 post #7. Result: 5-2-4- . ORANGE PASS, Orange Park, 01/12/2012, Evening, race 2 post #7. Result: 1-7-2- . KIOWA VANESSA, Orange Park, 01/12/2012, Evening, race 7 post #3. Result: 1-7-3- . KCK CANDIBAR, Palm Beach, 01/12/2012, Afternoon, race 4 post #4. Result: 6-2-3- . SHANETT, Southland, 01/12/2012, Evening, race 11 post #4. Result: 2-7-6- . MAGIC TORPEDO, Tri-State, 01/12/2012, Evening, race 13 post #2. Result: 5-7-2- . RAMS KIZZY KATE, Tucson, 01/12/2012, Evening, race 3 post #5. Result: 5-8-3- . GAME PLANE, Tucson, 01/12/2012, Evening, race 11 post #2. Result: 7-1-8- . OUT D BOX, Tucson, 01/12/2012, Evening, race 11 post #1. Result: 7-1-8- . FM SAPPHIRE, Birmingham, 01/11/2012, Afternoon, race 9 post #4. Result: 4-1-5- . DODGE CALIBER, Birmingham, 01/11/2012, Afternoon, race 12 post #1. Result: 1-8-2- . LAVA MATSUI, Birmingham, 01/11/2012, Afternoon, race 12 post #5. Result: 1-8-2- . DEMO DAISY, Birmingham, 01/11/2012, Evening, race 4 post #6. Result: 4-1-3- . COACH PRINCESS, Birmingham, 01/11/2012, Evening, race 9 post #6. Result: 8-6-1- . GABLE WARBUCKS, Bluffs Run, 01/11/2012, Afternoon, race 2 post #2. Result: 8-2-6- . KIOWA DELI DEE, Orange Park, 01/11/2012, Evening, race 9 post #6. Result: 1-7-5- . MONKEYS UNCLE, Palm Beach, 01/11/2012, Afternoon, race 10 post #8. Result: 6-4-2- . ATASCOCITA BOWL, Palm Beach, 01/11/2012, Afternoon, race 12 post #5. Result: 4-5-2- . GMC DIANE SAWYER, Palm Beach, 01/11/2012, Afternoon, race 12 post #6. Result: 4-5-2- . JS KERRY OKI, Palm Beach, 01/11/2012, Afternoon, race 12 post #8. Result: 4-5-2- . RK'S CONK GONK, Palm Beach, 01/11/2012, Afternoon, race 15 post #2. Result: 2-3-1- . UHAUL MUFFIN, Palm Beach, 01/11/2012, Afternoon, race 15 post #5. Result: 2-3-1- . WHATS NEXT, Palm Beach, 01/11/2012, Afternoon, race 15 post #6. Result: 2-3-1- . TROUGELZ, Southland, 01/11/2012, Afternoon, race 9 post #4. Result: 4-8-5- . SECRET SEEKER, Derby Lane, 01/11/2012, Afternoon, race 14 post #1. Result: 7-8-5- . BD'S RED DAWN, Derby Lane, 01/11/2012, Evening, race 13 post #8. Result: 8-6-5- . MULBERRY CORA, Tucson, 01/11/2012, Evening, race 2 post #8. Result: 3-5-2- . BELLA CUBANARO, Wheeling, 01/11/2012, Afternoon, race 12 post #2. Result: 2-3-7- . BELLA KAYAKER, Wheeling, 01/11/2012, Afternoon, race 14 post #4. Result: 1-4-3- . GABLE GO SHAUNEE, Bluffs Run, 01/12/2012, Afternoon, race 2, post #5. MC FULL MOON, Bluffs Run, 01/12/2012, Afternoon, race 15, post #7. ROUGH HUSTLE, Gulf Greyhound, 01/12/2012, Evening, race 10, post #2. KB'S HASLET, Mardi Gras, 01/12/2012, Afternoon, race 2, post #7. ORANGE PASS, Orange Park, 01/12/2012, Evening, race 2, post #7. KIOWA VANESSA, Orange Park, 01/12/2012, Evening, race 7, post #3. KCK CANDIBAR, Palm Beach, 01/12/2012, Afternoon, race 4, post #4. SHANETT, Southland, 01/12/2012, Evening, race 11, post #4. MAGIC TORPEDO, Tri-State, 01/12/2012, Evening, race 13, post #2. RAMS KIZZY KATE, Tucson, 01/12/2012, Evening, race 3, post #5. GAME PLANE, Tucson, 01/12/2012, Evening, race 11, post #2. OUT D BOX, Tucson, 01/12/2012, Evening, race 11, post #1. This Thursday January 12th, Hall of Fame Announcer and Wonderland legend, Dennis Clough, joins Randy Birch for a closer look at the American Greyhound Derby. 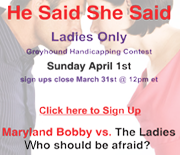 The Derby is returning this spring and is being run at Mardi Gras/Hollywood Greyhound Track. Please join us in the interactive Virtual Clubhouse at www.BigJackpotbetting.com and get caught up with Dennis Clough. This is an interview you won't want to miss.The interview will begin at 6:45pm eastern. Big jackPot Betting's live show will begin at noon Central/1pm eastern. FM SAPPHIRE, Birmingham, 01/11/2012, Afternoon, race 9, post #4. DODGE CALIBER, Birmingham, 01/11/2012, Afternoon, race 12, post #1. LAVA MATSUI, Birmingham, 01/11/2012, Afternoon, race 12, post #5. DEMO DAISY, Birmingham, 01/11/2012, Evening, race 4, post #6. COACH PRINCESS, Birmingham, 01/11/2012, Evening, race 9, post #6. GABLE WARBUCKS, Bluffs Run, 01/11/2012, Afternoon, race 2, post #2. KIOWA DELI DEE, Orange Park, 01/11/2012, Evening, race 9, post #6. MONKEYS UNCLE, Palm Beach, 01/11/2012, Afternoon, race 10, post #8. ATASCOCITA BOWL, Palm Beach, 01/11/2012, Afternoon, race 12, post #5. GMC DIANE SAWYER, Palm Beach, 01/11/2012, Afternoon, race 12, post #6. JS KERRY OKI, Palm Beach, 01/11/2012, Afternoon, race 12, post #8. RK'S CONK GONK, Palm Beach, 01/11/2012, Afternoon, race 15, post #2. UHAUL MUFFIN, Palm Beach, 01/11/2012, Afternoon, race 15, post #5. WHATS NEXT, Palm Beach, 01/11/2012, Afternoon, race 15, post #6. TROUGELZ, Southland, 01/11/2012, Afternoon, race 9, post #4. SECRET SEEKER, Derby Lane, 01/11/2012, Afternoon, race 14, post #1. BD'S RED DAWN, Derby Lane, 01/11/2012, Evening, race 13, post #8. MULBERRY CORA, Tucson, 01/11/2012, Evening, race 2, post #8. BELLA CUBANARO, Wheeling, 01/11/2012, Afternoon, race 12, post #2. BELLA KAYAKER, Wheeling, 01/11/2012, Afternoon, race 14, post #4. SLATEX TOPAZ, Bluffs Run, 01/10/2012, Afternoon, race 6 post #1. Result: 1-2-6- . BOC'S DOUBLEDOSE, Bluffs Run, 01/10/2012, Afternoon, race 9 post #2. Result: 1-2-7- . JET FORCE, Bluffs Run, 01/10/2012, Afternoon, race 11 post #2. Result: 8-2-7- . BACS XTREME, Palm Beach, 01/10/2012, Afternoon, race 11 post #1. Result: 4-2-5- . COUSIN KIM, Sarasota, 01/10/2012, Afternoon, race 12 post #2. Result: 1-2-5- . MESA BACKSTOP, Derby Lane, 01/10/2012, Evening, race 8 post #6. Result: 3-1-8- . RED PERSISTENCE, Tucson, 01/10/2012, Evening, race 5 post #7. Result: 7-1-6- . REDROCK MIRROR, Tucson, 01/10/2012, Evening, race 12 post #1. Result: 5-1-7- . MISSOURI MOMMA, Wheeling, 01/10/2012, Afternoon, race 4 post #8. Result: 5-6-1- . YO DURR, Wheeling, 01/10/2012, Afternoon, race 5 post #6. Result: 5-7-1- . WW GALE THIRTY, Wheeling, 01/10/2012, Afternoon, race 11 post #6. Result: 3-8-7- . ROUND THREE QUALIFYING FOR THE $50,000 HE’S MY MAN CLASSIC WEDNESDAY AFTERNOON, JANUARY 11! RK’S CONK GONK SEEKS TO REMAIN UNDEFEATED! West Palm Beach, Fl. - Palm Beach Kennel Club will present third-round action for the $50,000 He’s My Man Classic Wednesday afternoon, January 11. Following two rounds of point earnings, the original field of 63 hopefuls has been reduced to 32 athletes, all eager to make it to the top 16. And of those score plus 12 athletes, only Rader Racing Kennel’s RK’s Conk Gonk has the opportunity to enter the semifinals undefeated. Race 10 features the very well-positioned #8 Monkeys Uncle (Yahoo Omar - Flying Exorcist, Rader Racing Kennel). Looking to also be in the mix will be #1 Kane’s Getty (Lonesome Cry - Flying Trey Babe, Brindle Kennel), #4 Flying Halladay (Kiowa Sweet Trey - First Hand Smoke, Steve Gilster Kennel) and second-round winner #5 JS Millermatic (Trent Lee - JJ Guinevere, Pat Collins / Neola Joe Kennel). In Race 12, the undisputed fan favorite will be the impressive #1 Turbo Razor (Kiowa Sweet Trey - Turbo Windblown, Rader Racing Kennel). Although not his most-favorite post position, Razor should be able to outgun the other seven Classic entries to the first turn. Of course, if any problems ensue, be looking for the big finishers #3 M Cee Drive (Rhythmless - Malice Drive, Tru Palm Kennel) and 545-yard Royal Palm Course track record holder #5 Atascocita Bowl (Dodgem By Design - Atascocita Sally, Suncoast Kennel) to take full advantage of it.